In this chapter we present WALK-MAN, a humanoid platform that has been developed to operate in realistic unstructured environments and demonstrate new skills including powerful manipulation, robust balanced locomotion, high strength capabilities and physical sturdiness. To enable these capabilities, WALK-MAN design and actuation are based on the most recent advancements of Series Elastic Actuation (SEA) drives with unique performance features that differentiate the robot from previous state-of-the-art compliant actuated robots. Physical interaction performance benefits from both active and passive adaptation thanks to WALK-MAN actuation, which combines customized high performance modules with tuned torque/velocity curves and transmission elasticity for high speed adaptation response and motion reactions to disturbances. The WALK-MAN design also includes innovative design optimization features that consider the selection of kinematic structure and the placement of the actuators with respect to the body structure to maximize the robot performance. Physical robustness is ensured with the integration of elastic transmission, proprioceptive sensing and control. WALK-MAN hardware was designed and built in 11 months, and the prototype of the robot was ready 4 months before the DARPA Robotics Challenge (DRC) Finals. The motion generation of WALK-MAN is based on the unified motion generation framework of whole-body locomotion and manipulation (termed loco-manipulation). WALK-MAN is able to execute simple loco-manipulation behaviours synthesized by combining different primitives defining the behaviour of the center of gravity, of the hands, legs and head, the body attitude and posture, and the constrained body parts such as joint limits and contacts. The motion generation framework including the specific motion modules and software architecture are discussed in detail. A rich perception system allows the robot to perceive and generate 3D representations of the environment as well as detect contacts and sense physical interaction force and moments. The operator station that pilots use to control the robot provides a rich pilot interface with different control modes and a number of tele-operated or semi-autonomous command features. 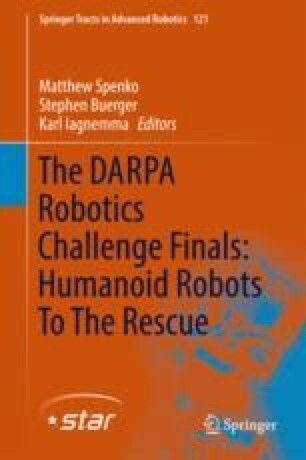 The capability of the robot and the performance of the individual motion control and perception modules were validated during the DARPA Robotics Challenge in which the robot was able to demonstrate exceptional physical resilience and execute some of the tasks during the competition. A version of this article was previously published in the Journal of Field Robotics, vol. 34, issue 7, pp. 1225–1259, ©Wiley 2017. The development of the WALK-MAN platform is supported by the WALK-MAN FP7-ICT-2013-10 European Commission project. This work would not have been possible without the major support from the Italian Institute of Technology and the University of Pisa and the great talent skills and incredible commitment and passion of all members of WALK-MAN team. Kanoulas, D., & Vona, M. (2014b). The surface patch library (SPL). In The 2014 IEEE ICRA Workshop: MATLAB/Simulink for Robotics Education and Research. http://ccis.neu.edu/research/gpc/spl.